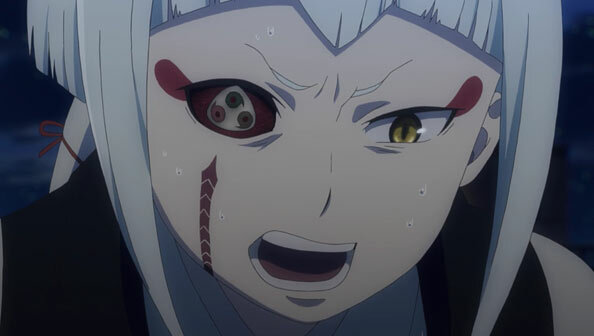 As soon as we were in flashback mode with Mamushi, I knew Ao no Exorcist had a better story to tell than her turn to the dark side and ultimate demise. It was also an early indicator I was in for a good episode, and this turned out to be the best Ao 2 to date. For once, I wasn’t feeling impatient or shortchanged during the credits. Instead, I was pumped up. 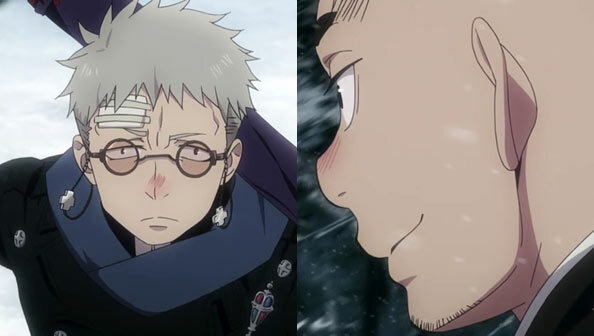 Whether intentional or not, the backstory of Master Tatsuma meeting Fujimoto, and the resulting expanding of his world (and evolution of his beliefs) is, at least so far, the best thing to come out of this Ao 2. I’d say it’s done Rin & Co. a disservice by sidelining and outshining them, if it wasn’t such a good backstory. Of course, when the guy you thought was a bandit ends up healing your comrades…and your pregnant wife you thought was going to die, that tends to have a profound effect on how you look at the world and how you judge people. 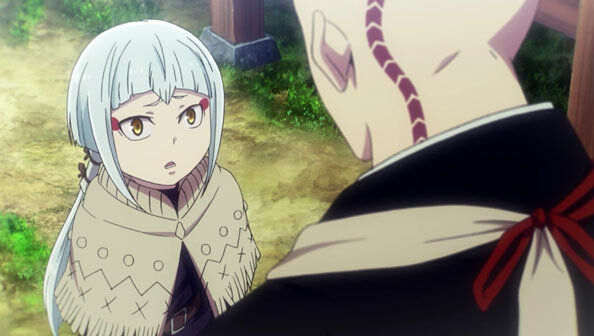 Despite his bluster and stated plans to kill a kid with the Koma Sword, Fujimoto spends enough time with Fujimoto to know he won’t actually kill the kid he speaks of (the, ahem, spawn of satan, as it turns out). And Tatsuma is done praying to a sword he knows is empty, having unsheathed it as a curious youth. 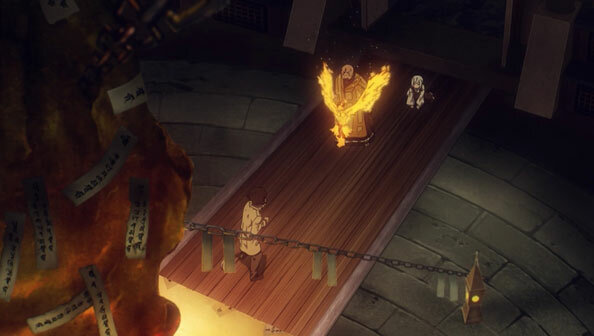 By being exposed to Fujimoto, Tatsuma learns there may be a better way to protect his people other than strict, at times self-destructive orthodoxy. So ever since his father died and passed on the ultimate secret of the Myoda sect to him, he’s been looking for a way to exit the sect from its 150-year obligation. 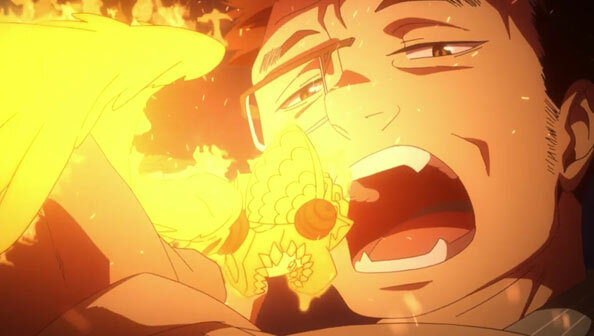 To Mamushi’s surprise, that obligation turns out to be holding the shriveled body of the Impure King, employing the power fire demon Karura and removing the King’s eyes to keep him in a dormant state. 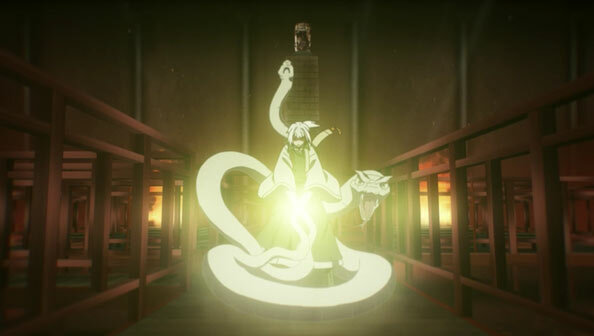 Karura not only demands but draws its power from the secrets of men—the more and bigger the better. Of course, when the guy you thought was a bandit ends up healing your comrades…and your pregnant wife you thought was going to die, that tends to have a profound effect on how you look at the world and how you judge people. Those secrets have done nothing but allow the Myoda to keep, essentially, a nuke in their sub-basement. Mamushi, who is also determined to protect her people, is quickly betrayed by her former teacher when he takes the eye she was carrying and re-awakens the Impure King himself, Akira-like in form and expanding to ginormous size. The twist is that the titular Fujouou isn’t even Todou’s target. He only awakened the King to force Suguro Tatsuma out and compel him to summon Todou’s true target: Karura, whom Todou devours and from whom he gains youth and vigor. Todou is now more powerful than ever, but to my relief, Mamushi is no longer his acolyte, now that she knows their interests don’t align at all. Before Karura is taken from him (and before he’s stabbed through the throat) Tatsuma manages to seal the Impure King with a powerful spell. But using that spell means he can no longer defeat him. 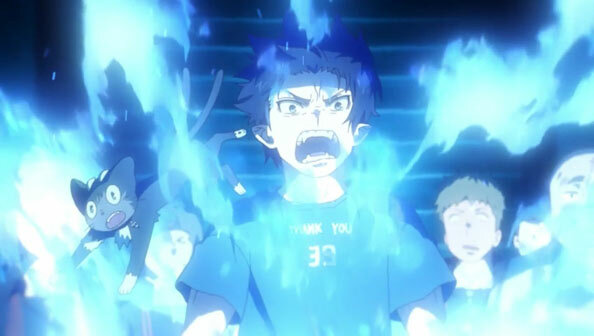 He entrusts that task, in his hastily-scrawled letter, to Rin, knowing it’s an unenviable task to be saddled with, and indeed that it could result in Rin’s death, either by failing to take down the King or by being executed by the authorities for using his blue flames. Of course, we all know Rin isn’t just going to sit back and save himself. 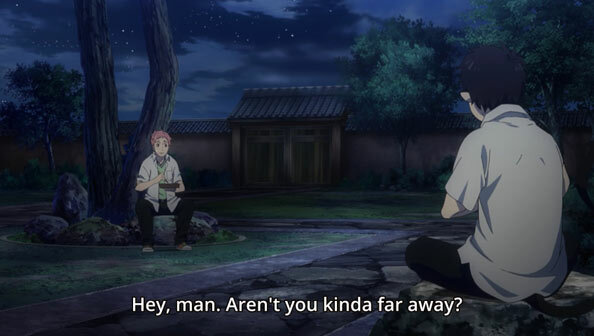 Tatsuma saw a good man in Fujomoto, and clearly saw a good young man in Rin. I doubt Rin will let him down. Alright: I’m officially frustrated with how slowly this arc is moving. It’s one thing to spend an episode or two in one place, but this is getting ridiculous. 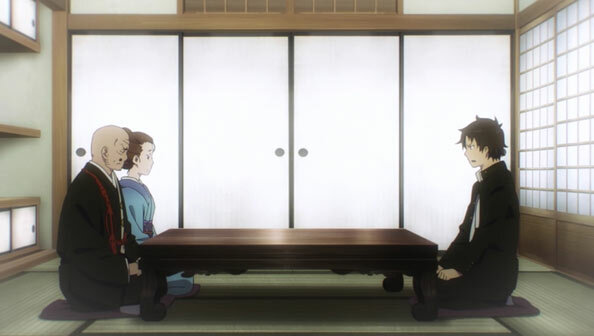 Yaozou holds another tedious meeting to bring everyone up to speed, and we keep seeing the same flashbacks of Rin flaring up and standing trial. The show seems to be spending so much time reminiscing while setting the table, I’m starting to lose my appetite. 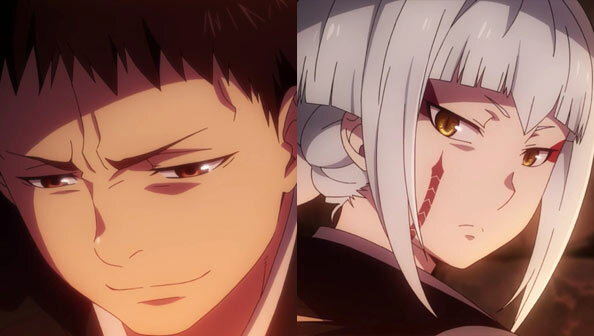 Mamushi, still being portrayed with the possibility she could still be redeemed, if barely, is having difficulty bearing the evil of the Right Eye, but Todou claims he can’t bear them both alone. Mamushi honestly thinks she’s doing what’s best for her order, so a little suffering is par for the course. 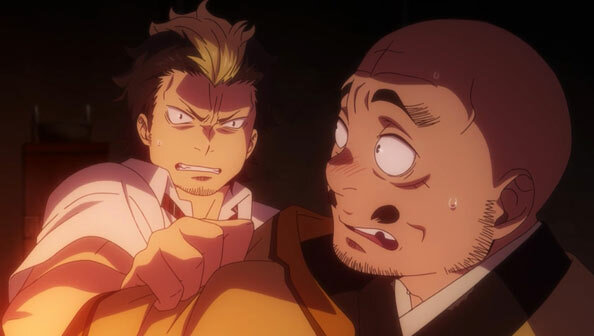 The sitting around back at Myoda HQ is all the more frustrating because no one, save Tatsuma, seems to be in any hurry to follow Todou and Mamushi. Granted they vanished without a trace, but…you’re exorcists. Do something exorcisty to detect and find them! 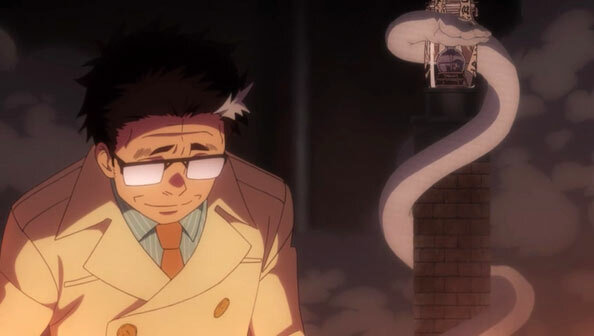 Instead we get more meetings, then are treated to Yukio reading a letter by Tatsuma that’s as big as a goddamn book. 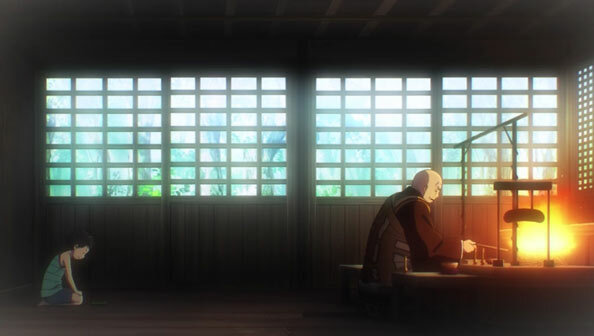 Granted, at least the book-letter takes us to a different place, namely the Myoda Temple years ago, when Tatsuma was a young man with a dying pregnant wife and preparing to take over from the master, his ailing father. 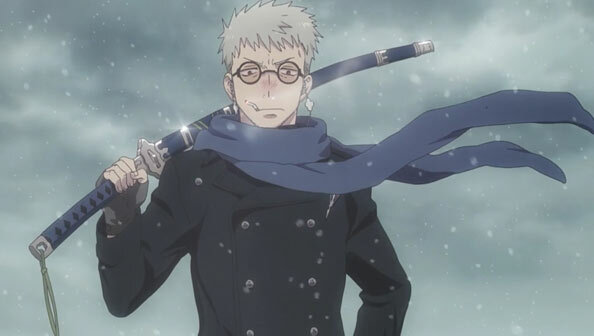 We also learn that Rin’s Koma Sword was once the main relic of the Myoda sect…until one day Rin and Yukio’s dad…stole it. Now that sounds like an interesting story. 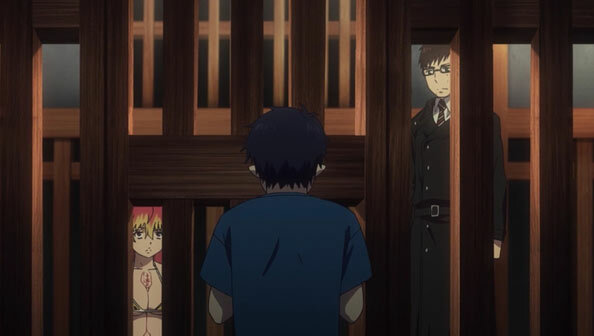 But in the back of my mind, I know that back in the present Rin and Yukio and Shura are sitting around in a jail doing nothing. What little momentum had been built up isn’t likely to survive such a leisurely stroll down memory lane. I for one found it refreshing that Rin & Co. didn’t immediately end up in the middle of a war zone upon arriving in Kyoto. There’s definitely casualties whom they must tend to, but the main battle feels far away. 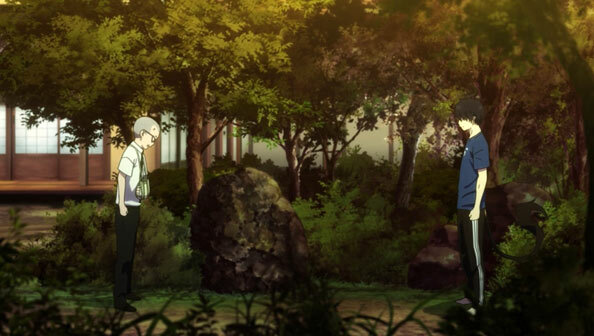 Instead, Rin finds himself in the hometown of three friends of his who are feeling very uneasy around him. He meets Bon’s parents, who are nothing like he imagined. 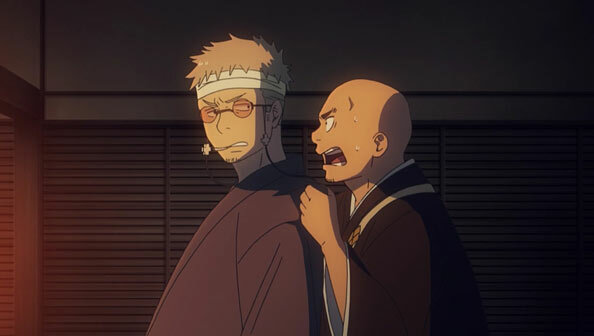 After two minutes with his dad, Rin is prepared to label him a “degenerate monk”, which just so happens to be what a lot of others in his sect have called him for years, much to the frustration of his son Bon. 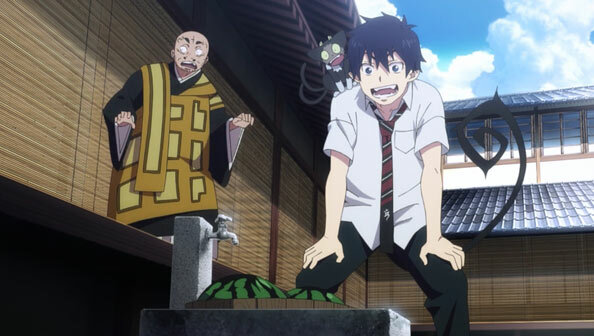 Rather than end up in the middle of a fight against the forces trying to revive the Impure King (or whatever), Rin and his mates perform relatively menial tasks, but those tasks still have to be performed, as they’re important. During their service we see the long-standing rivalry between different clans within the sect, one of which is really into snakes. Bon’s dad is nowhere to be found, so it falls to him to break up fights – and hear what people call Pops. We get some nice peaks into Bon’s past, and see how much he loved and admired his dad, who always kept to himself chanting sutras. Bon learned those sutras, but he also watched as the order his father belonged to wither away, to the point they had to align themselves with the True Cross Order in order to stave off oblivion. Meanwhile, Rin tries to think of a way to mend fences with Bon, as well as his other spooked friends. 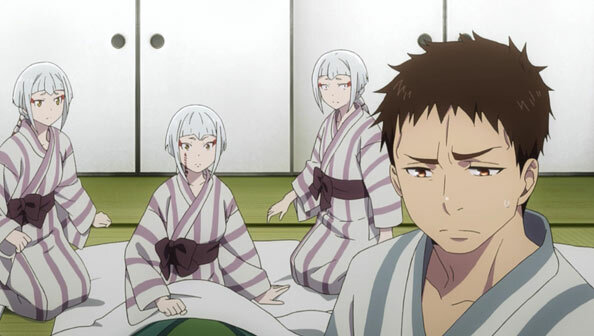 Unfortunately he and Shiemi don’t say a peep to each other for the second straight week, but hopefully they’ll reconcile at some point. 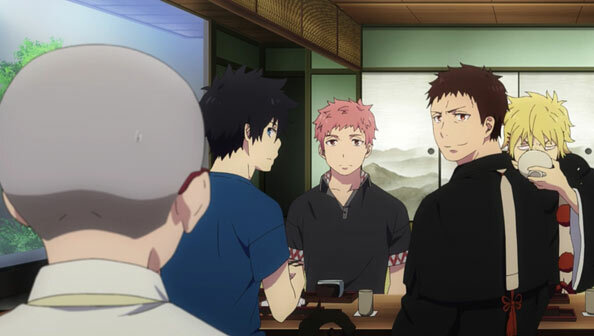 For now, Rin has to be content with Shima, who ends up the last person with Rin with no excuse for slinking away, but also finds that it’s a much bigger hassle to avoid Rin than to talk to and treat him like he did before Rin went berserk. Shima’s are probably the easiest good graces to return to, however. Bon’s deal is that he always wanted to follow in his father’s footsteps, but he had the kind of father who didn’t want that, and so conflict arose between them, which hasn’t been sufficiently resolved since before he dyed his hair. But Bon’s no innkeeper, and he never was. 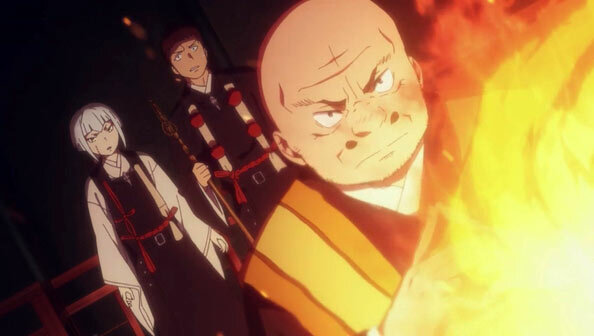 He’s an exorcist, a damn good one, and he’ll play a big role in the coming battle against pro-Impure King forces. I think when Rin learned Bon has been having a long fight with his Dad, he was heartened, a bit. Bon only butts heads with those who matter in his life. Relationships will have to be prepared if the good guys are going to have a chance. And despite having Satan as a father, Rin is a good guy. Five years, three months, and five days. 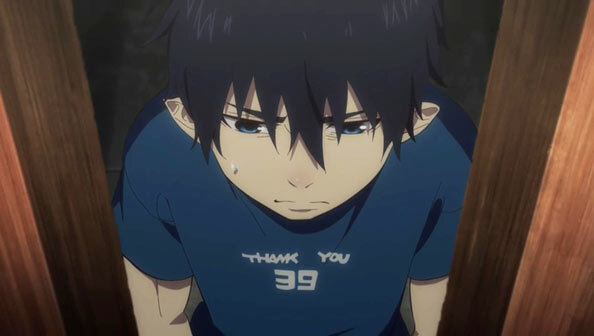 That’s how long ago I last laid eyes on Ao no Exorcist. Back then, we hadn’t even split up writer accounts yet! As such, I was seriously worried about not knowing what the heck was going on, and was both hoping for and hating myself for needing at least some kind of recap to bring me up to speed. Imagine waiting until 2021 for the next season Game of Thrones! 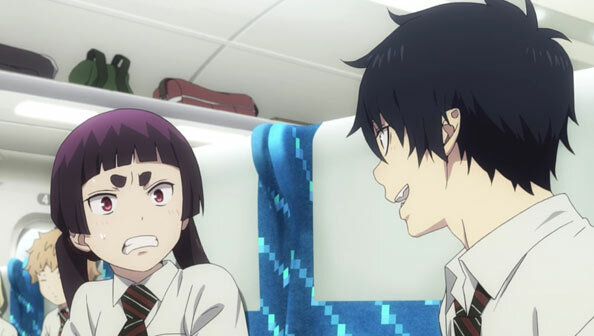 The first episode of this sequel, “Small Beginnings”, largely drops us right back in the world of the Okunuma brothers, exorcists, and True Cross, and to my relief, it’s like riding a bike: it all started coming back. By starting small as the episode title suggests, the show avoids the need for too much lengthy expostition about what has happened (though there is a bit of that, in addition to exposition about what will be happening this season). This is the Kyoto Fujouou-hen, or Kyoto Impure King Arc, and one of his eyes is stolen by Todo Saburota, one of the grizzled mid-level exorcists entrusted with guarding it. Todo is disaffected by his station, feeling it too small commensurate to the effort and loyalty he put in, so he’s gone over to the demons. 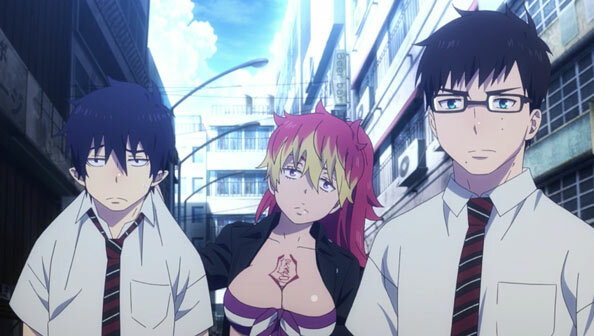 After saving a kid hostage Todo didn’t seem terribly interested in, Rin, Yukio, and Shura join the rest of the gang aboard a Kyoto-bound Shinkansen bound to locate and retrieve the eyes of the Impure King, lest they be used to kill more people. 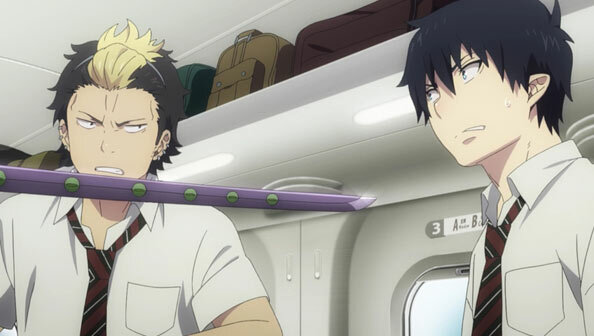 On the train, Rin encounters some fallout from going berserk last season, and his friends, even Shiemi, express various combinations of fear, anger, mistrust and betrayal. That doesn’t seem like the ideal dynamic for a team with such a seemingly important mission, but as Shura says this shouldn’t be the toughest mission (it isn’t as if they’re dealing with Satan himself; Todo seems to have traded one mid-level role for another) and perhaps the best way to mend fences is through work. 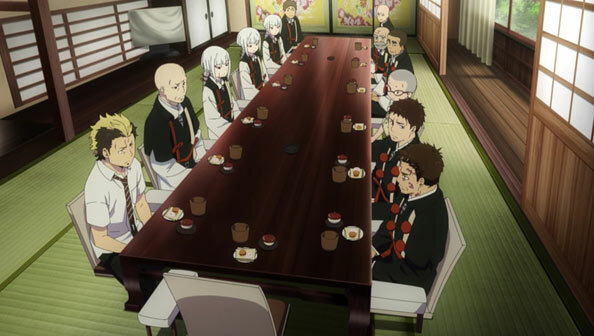 The only one who deigns to sit beside Rin is Kamiki Izumo, who (in her tsundere way) doesn’t feel it fair to condemn Rin simply for being what he is, which isn’t his fault. Lots of exorcists having demon lineage, after all (and I for one wouldn’t mind sitting next to a kitty on a train). 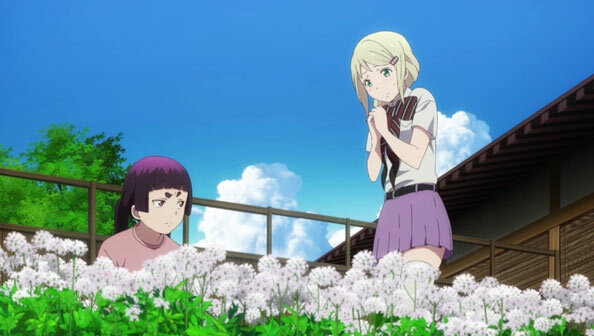 That being said, Bon and Konekomaru have lost family to demons, and aren’t so quick to trust Rin. I’m not so quick to start liking Rin either. He has a point, but he could be a little less brusque about it, just like he didn’t need to laugh back in the immediate aftermath of his friends discovering his true roots. 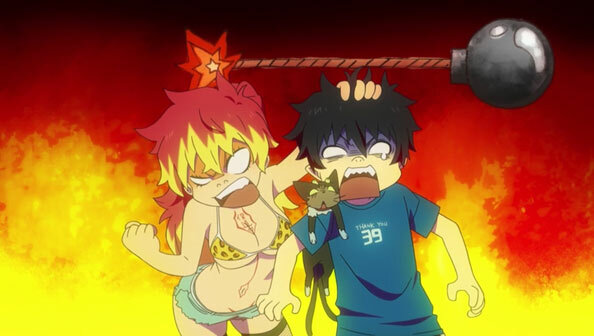 One of the most annoying elements of AnE is having to endure Okamoto Nobuhiko’s harsh, petulant depiction of Rin, but otherwise this was a far smoother re-entry into the worl than I expected.